Welcome to Spellburn, a new podcast about the Dungeon Crawl Classics Role Playing Game. In this premier episode, your dungeon-crawling hosts, Jim, Jobe and Jeffrey, introduce themselves, take you on a brief tour of the new role playing game, and offer advice to players and judges alike on how to get started with the Dungeon Crawl Classics RPG. Great start, guys; looking forward to more. Jim, thanks for the shout out. Glad you’re enjoying the Colossus play-test as much as I am! Enjoying the first episode right now, and really excited about some new material. I’m not a DCC convert yet (I’m sure I’ll recover from that condition soon), but I’m always on the lookout for new content. Excellent! Heh, I was a lot like Jeffrey when I was a kid too, but class of 79 like Jim! Lots of solo-ish-play and lots of researching, reading and learning with a bit of playing. Oh, and thanks for the shout-out for Crawl! I plan to publish Jeff’s Dwarven Cleric SOON! Great first episode! My favorite things about DCC…the funnel…(there needs to be a DCC podcast called ‘Level 0’, BTW. I also like the minimalism. One book that does it ALL. This strikes me as a powerful counterpoint to the logic of other systems. I think it invites more imagination on the part of the players and the GM. Looking forward to more shows! Excellent episode guys, looking forward to listening again. “Houston we have cleared the tower!” Great first episode, looking forward to hearing more. Keep up the good work. I’ll be listening to future podcasts as well. If Jim is the evangelist, I want to be his acolyte. Preach on, brother! Great podcst. I’ve been playing DCC RPG in London for the past 6 month and having a lot of fun with it. Keep up the good work! Nice job on the podcast gents! I think the DCC community all has a lot in common, and the game is growing fast. I’ve reintroduced some friends to RPGs after a 25 year hiatus with DCC and I am looking to bring it to other groups. I think DCC has a great future and your podcast will be a big part of it. Thanks for all the encouragement and it’s especially gratifying to hear kind words from the mastermind behind DCC RPG. Loved the first episode! Looking forward to the next, keep up the great work guys! 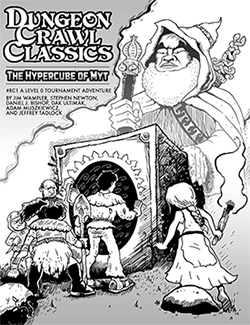 VERY new DCC RPG gamer (picked it up for the first time on Free RPG day) and love it. Looking forward to future podcast to help me run my group through the game. Finally got around to listening to episode 1 and downloaded episode 2. Off to a great start. For the record, I have the Gold Foil version (signed by Doug Kovacs at GaryCon this year) and I have the Jeff Easley cover on pre-order from Goodman (wanted to get the errata and index, so I figured I’d go big). Got to play Michael Curtis’s forthcoming stone age/sci fi adventure (Frozen in Time) and something totally bizarre game that Doug Kovacs whipped up at GaryCon. He kind of did a Fiasco meets DCC to kick off the game, forcing our characters to have relationships beyond “adventuring companions”. Is that a clip from something? I can’t place it. I started listening last summer after seeing the RPG and wondering if it was any good. I bought the book shortly after listening to Spellburn for a few episodes. Sold. And I’ve been running DCC regularly ever since.